The James Avenue Pumping Station is located at 109 James Avenue, just north of the East Exchange District. It received municipal heritage designation on November 15, 1982, and it is currently being redeveloped into a mixed use building. The stately grandeur of the James Avenue Pumping Station at 109 James Avenue is immediately apparent when approaching the building - set back from Waterfront Drive, the ghost of the former rail lines lies in the extra space between the pumping station and the road. When it was built, the James Avenue Pumping Station was the largest and most impressive building of its kind in North America, and was built to last. The architects, engineers, and construction workers who built this high pressure pumping station subscribed to a different kind of motto - solid, massive structures that would last not just one lifetime, but several. James Avenue Pumping Station, 1970. 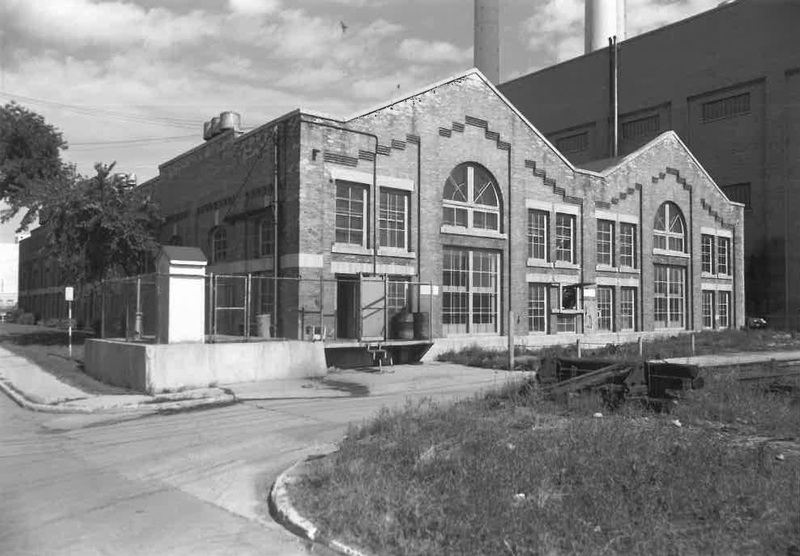 The James Avenue Pumping Station was opened in 1907, designed by Henry Norlande Ruttan, who was the first City of Winnipeg Engineer. Built in brick like so many other buildings in the Exchange District, the high pressure pumping station features a symmetrical facade with a twin gable roof. However, the real treasure was the state of the art machinery inside the station, capable of pumping over 9000 gallons of water a minute at 300 psi - considered one of the most modern systems in the world when it was made. The pumping station was meant to assist in fire-fighting by providing much higher pressure water that the city's existing artesian well system. 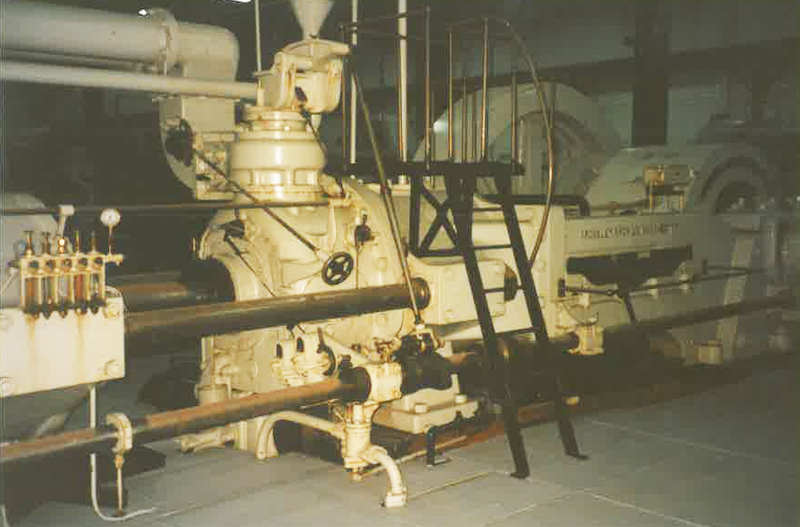 The machinery used was so modern that a convention was held a few years later, for other officials in the Dominion to learn from what had been done right here in Winnipeg. One of the massive pumps that delivered water for the city. Visible on the side is the maker's stamp, from Manchester. The fire fighting force well needed some assistance, given the many buildings lost to fire in the previous years. Buildings in the late 19th and early 20th century used a good deal of wood as building materials, particularly before cheap steel became widely available. Many prominent buildings were prone to fire and indeed did catch fire, especially the infamously blaze-prone Mansard roofed buildings. Without the James Avenue pumping station, there would be much fewer heritage buildings in the downtown area still standing today. 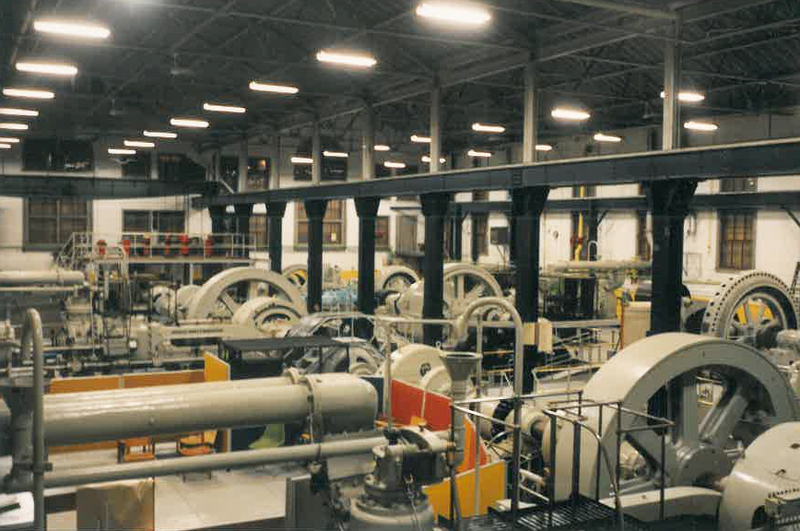 In 1962, the pumping station was converted from using coal to natural gas and electricity. It operated until 1986 when the City of Winnipeg closed the station. 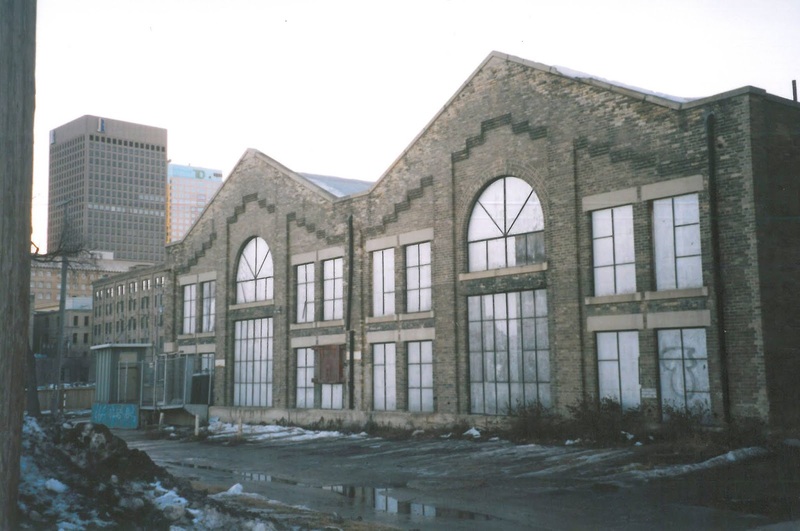 Even before the pumping station closed, Heritage Winnipeg was concerned about finding a use for the building, especially after it had received heritage designation on November 15th, 1982. However, when the old pumping station closed it had no plans for the future. Over the next thirty years, over fifteen different proposals were rejected for the James Avenue Pumping Station. In 1997, one particularly promising proposal, for what would have then been Winnipeg's first microbrewery, was rejected on the grounds of "incompleteness". The three men who were behind the brewery had spent several hundred thousand dollars to prepare the necessary documents over six months, and had already lined up around $2.5 million in investment to redevelop the building, as well as $400,000 in government grants. The plan was endorsed by many Winnipeg groups, including Heritage Winnipeg, as well as Downtown BIZ, and CentreVenture. Nevertheless, the City of Winnipeg councillors unanimously voted it down, based on their impression that the business plan was too vague. Later, in 2000, the building changed hands as CentreVenture sold it to a father and son duo - only to buy it back three years later, at three times the price, and discovered that a piece of the priceless heritage machinery had been donated illegally to a heritage museum in Austin. James Avenue Pumping Station, no date. Having an active tenant in a heritage building is one of the most important factors in preservation of the building. When a heritage building stands empty and regular repairs and maintenance are not completed, damage compounds and may result in the building being demolished due to structural issues. While it is important for city councillors to consider how a business plan may impact the character-defining elements of a designated heritage building, appropriate business plans should be encouraged in order to save the building as a whole. If not occupied, even though there may be the best of intentions at play, an unused heritage building is an at-risk heritage building. Particularly in the case of City ownership, many heritage buildings have lain empty for too long. Although various other plans were brought forward, including 13 different proposals since the year 2000, all have ultimately failed due to rejection from the City of Winnipeg. Then Bryce Alston and Rick Hofer purchased the building from CentreVenture in 2016, with their proposal for adaptive reuse finally getting the nod of approval from the city. Working with the firm 5468796 Architecture, their project has a $20 million budget and includes the construction of two new mixed use buildings, bordering the James Avenue Pumping Stations' east and west facades. Within the station itself, a floor plate will be installed above the turn-of-the-century machinery to house new office space. 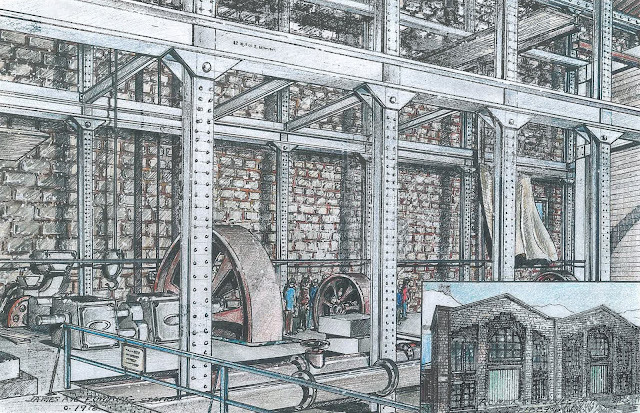 Tenants will be able to look down into the original floor of the historic pumping station and see the gleaming machinery that was so revolutionary when it was introduced. The project is expected to be completed in early 2019. As we move forward into the future, innovative and astounding technological advancements become almost commonplace. In many ways, the turn of the 21st century parallels the turn of the 20th century - in digital innovation instead of machinery. 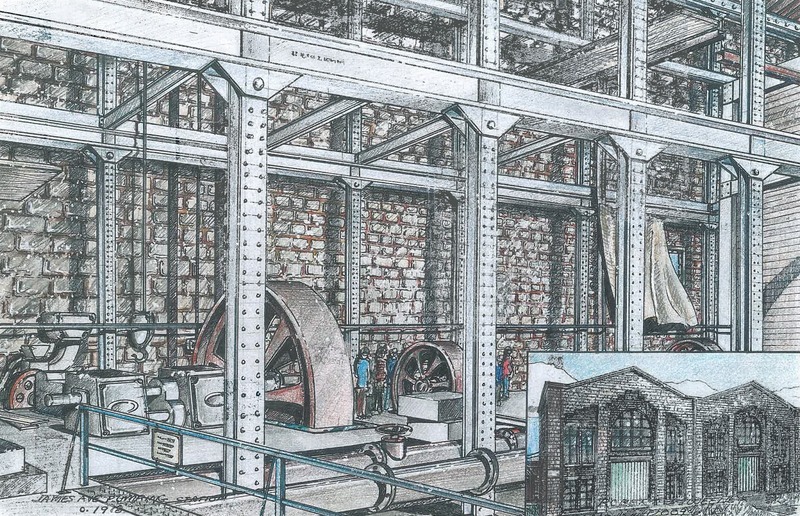 As much as learning about the past can help us better understand the present and the future, it's perhaps also very important to not forget the sense of wonder that accompanied the development of the new and unique machinery housed in the James Avenue Pumping Station. That sense of wonder and appreciation can allow us to truly appreciate the advances in technology that we have today. 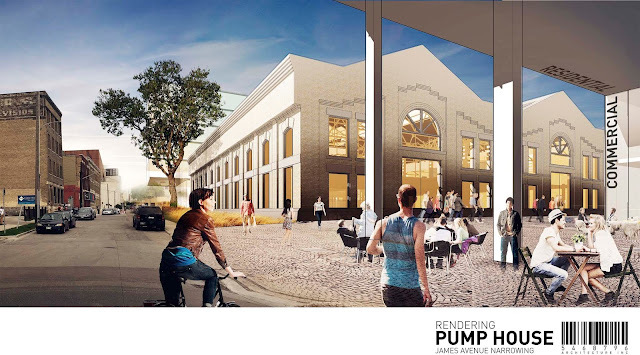 The James Avenue Pumping Station is only one example of a creative re-use of a heritage building. There are many other examples of historic buildings in Winnipeg being used for purposes other than their original ones - of course, many historic buildings are still used for their original purposes as well (like the Bank of Montreal). Which historic buildings have you been in that are adaptively re-used? Heritage Winnipeg is a non-profit charitable organization established in 1978 which promotes the restoration, rehabilitation and preservation of Winnipeg's built environment. Please consider making a contribution to support the work of Heritage Winnipeg. Tax receipts will be issued for donations over $10.